Planning an event? Maybe you’re getting married? Then again perhaps you just want to spruce up your home décor in time for spring…whatever your reason is, you totally want to be up on floral design trends for the 2017. Todich Floral Design takes a deep dive and provides a sneak peak at upcoming spring flowers, 2017 floral designs, and flower fashions for the year ahead. Trends and styles in floral design are everchanging, shifting like the seasons of the year. Floral design trends can also be a little tricky to predict as they’re tied to and influenced by world events. Needless to say, it’s difficult—practically a full-time endeavor!—to keep current with the latest and freshest, the flashiest bunches of blossoms or the more alluring bouquets, the sweet and seductive floral designs for the year, no matter what your plans or purpose. A momentous, unexpected year in global politics and advent of spring is rapidly shaping and shifting the floral landscape, especially when it comes to the hues, shades, and colour palettes of blossoms for the 2017 spring flower season. What’s trending, exactly? A lot of fervent and fiery petals that vie for the eye and grab your gaze have been supplanted by relatively subdued hues—apricots, creams, beige, bicolored roses, verdant whites, peach, pale pinks—and underlying shades of white or grey. Why is this the case? The lighter colours provide an emotional balance and equilibrium in bouquets and event flower arrangements that balance out our psyches and mental states, as it’s easy to get caught up in the news and the year’s more tumultuous events. 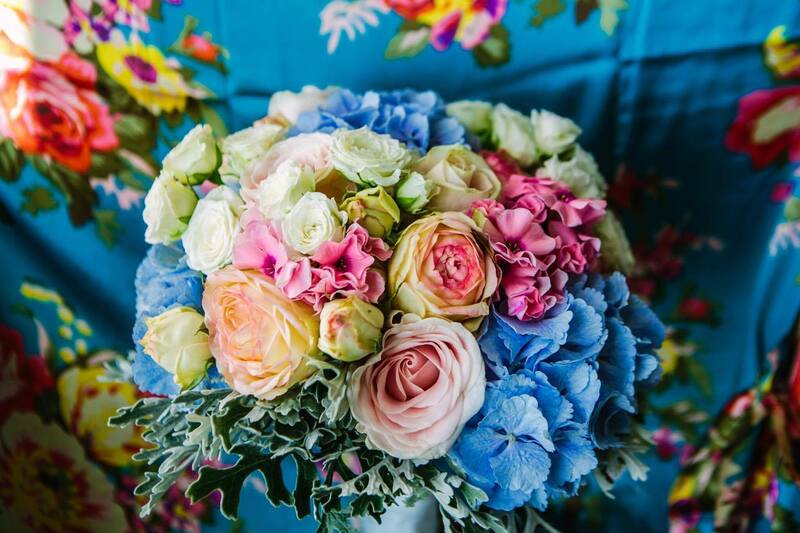 Falling in line with the general colour shift, wedding flower styles are shifting to assuage generalized concern and unease, and instead focus on tender, more feminine bouquet compositions and nuanced colourations. No bold, brash and I-speak-louder-than-thou palatial floral displays here—or, if there are, then floral design aesthetics at least balance the piece as a whole. For example, we are seeing lots of rustic style wedding bouquets coming back in fashion, bucolic and evocative of countryside innocence, splendor and times that were more carefree. Even at a joyous occasion such as a wedding, where we look forward to a bright future full of love, a sense of nostalgia and looking to the past can find its way into flower designs. Sprawling, winding bouquets that drape across tables or hang luxuriantly within the brides grasp are made from vines, greenery, tiny buds and white hued to cream-coloured blooms with slender, feathery blossoms. A natural sense of romance is key in this spring’s wedding designs and styles, a sense of wildness and the raw potential and allure of nature, without the chaotic or unnerving connotations of urban living and modernity. This spring you can expect lots of fresh flower varieties with profuse petals, including English roses, hydrangeas, marigolds, ranunculus and gerberas daisies, balanced by wildflower frills and ruffles of garden greenery.